C Spire unveiled its new 3,458 square foot, customer-inspired store in D’Iberville today – promising to transform and redefine the retail shopping experience with a new, fresh approach that captures the imagination, discovery and excitement associated with shopping. The new store, located at 3822 Promenade Parkway in the Promenade Shopping Center, is the result of more than a year of exploration and research by C Spire - all designed to deliver on the company’s customer inspiration promise and bring to life a shopping experience like no other by creating a more interactive and inviting store environment. Hayes said the D’Iberville store, which was previously located at 3920 Promenade Parkway, delivers an interactive shopping experience that mirrors how customers live, work and play and will help the company move closer to its goal of becoming known as one of the nation’s premiere retailers. No detail escaped the focus of the team responsible for bringing the company’s vision of a reinvented retail experience to life. Colors, store layout, designs, materials and service delivery all were scrutinized with the goal of appealing to a multi-generational cross section of consumers. The store is highlighted with reclaimed hardwood, Hayes said. C Spire even commissioned Augusta, Florida sculptor Marlin Miller to fashion a special wood sculpture of the company’s iconic brand logo using reclaimed wood from Live Oak trees lost in 2005 in the aftermath of Hurricane Katrina. The artwork is prominently displayed on an inside wall visible to shoppers when they enter the store. The store, which officially opened on July 15, held a grand opening today with a ribbon-cutting, reception and celebration featuring C Spire executives, city officials and local business and community leaders. Food, prizes and giveaways were part of the party atmosphere and program. C Spire and D’Iberville Mayor Rusty Quave also presented a $1,000 contribution to St. Vincent de Paul, a local non-profit charity during the program. Everything inside the store is modular, scalable and designed for ultimate flexibility, according to Hayes. 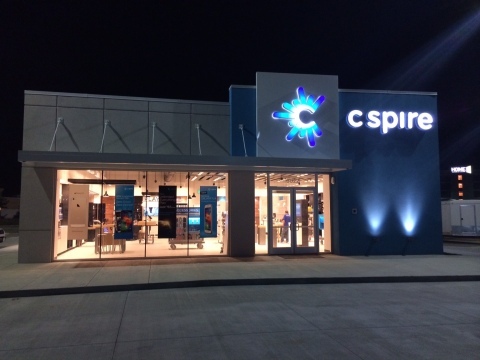 The store highlights C Spire’s consumer and business telecommunications and technology products and services, devices and accessories across four unique areas – explore, live, work and play. A new Live area features a smart tech display wall with devices, accessories and other applications that consumers can discover, explore and learn how they can be used in everyday life. The section focuses on topics like health, home security and entertainment. A Work section highlights products and services offered by C Spire Business Solutions, including demonstrations of “Find-me-follow-me,” IP Voice device features, Push-to-Talk service, wireless phones, hosted Exchange email services and customer testimonials on touchscreen video displays. A Play area that encourages customers to shop and play in an open and interactive space. The area helps consumers understand and learn how apps, accessories and devices can work together. An Explore area has walls that highlight C Spire’s diverse music accessories line up complimented by digital monitors with product information. What consumers won’t see in the new D’Iberville store is the traditional retail “cash register” counters. Instead, those have been replaced with round “learning tables” that allow for natural conversations with C Spire team members, who are equipped with tablets supported by a point-of-sale system that offers flexibility for helping consumers anywhere in the store. Customers also won’t see printed product information common in most stores. That’s been replaced by digital signage, e-brochures and interactive video monitors, offering consumers the information they want and need literally at their fingertips while giving C Spire the flexibility of updating messaging faster and more efficiently. The D’Iberville store’s hands-on design aims to engage shoppers and provide a “try before you buy” customer inspired service experience, according to Josh England, market manager for C Spire in D’Iberville. England and his 10-member staff are trained to assist consumer and business customers with individual purchasing decisions, customer-inspired service and technical support. Regular store hours of operation are Monday through Saturday 9 a.m. to 8 p.m.
“We’re proud of our new store, but we’re even more excited about continuing to contribute to the economic development of this region,” England said. The new retail location builds on C Spire’s significant capital and network investments in D’Iberville and Harrison County, including availability of 4G LTE services that offers data speeds up to 10 times faster than previously available. C Spire is a diversified telecommunications and technology services company that provides world-class service and a superior, comprehensive suite of customer-inspired wireless communications, high-speed Internet access and a range of other telecommunications products and services to consumers and businesses. This news release and other announcements are available at www.cspire.com/news. For more information about C Spire, visit www.cspire.com or follow us on Facebook at www.facebook.com/cspire or Twitter at www.twitter.com/cspire.